Lately, one of the dominant themes to surface during my parish’s post-Liturgy coffee hour is the complicated nature of conversion. Newcomers ask me and other “converts” (of course, we’re all converts! But you know what I mean…) why we became Orthodox, and many of us find it’s simply too difficult to explain our reasons. As one friend has pointed out, it’s almost easier to explain your conversion before you actually convert (read: are chrismated). The reasons that bring us to an Orthodox Church initially tend to be pretty simple. It is only with time, years and years, you begin to see that the reasons God brought you here (and keeps bringing you here) are deeper, more ineffable than originally believed. We try to explain this to newcomers, that it’s hard to reduce a conversion down to a few bullet points. But I’m not sure they understand–I’m not sure even I understand my own journey. Why is conversion so complicated? The first reason for this, I suppose, is mystery. How God changes us and resurrects our lives is a holy mystery; we often don’t even get to peer behind the veil of our own lives. Kuhn’s classic, The Structure of Scientific Revolutions, was one of the most important books I read in graduate school. In it, he broke down the process of scientific advancement, specifically the Copernican revolution. For Kuhn, scientific revolution occurs not merely when practitioners gain enough new information/data to be intellectually convinced, but rather when this information offers a paradigm that is simpler or is more intuitive than the old one. That paradigm shift occurs only after data reaches a tipping poing, a critical mass, and offers a new narrative to explain reality. Using the Copernican revolution as an example, Kuhn argued that this system initially appealed to a group of practitioners (albeit few) not because its data was more accurate than the Ptolemaic model (there were still a lot of kinks to work out). Instead, they were swayed by the possibility of a simpler set of formulas, a more elegant paradigm or narrative. Under the Copernican system, although the earth was not the center of the cosmos, the cosmos itself was simpler and more comprehensible. No more were endless epicycles needed to account for the retrograde motion of planets, no more did practitioners have to exhaust themselves trying to make reality conform to geocentrism. On the flip side, of course, were opponents to the new Copernican system. We know that Galileo was thwarted by the Catholic Church–chiefly its Inquisitorial arm–for his belief in a heliocentric universe. Here, too, we see paradigms at work. Regardless of how convincing heliocentric astronomy had become by the seventeenth century, the Church (or at least those in the Catholic Church who took issue with Galileo) could not accept the new theory because it lacked a paradigm to adequately make sense of a geocentric cosmology. Had not the world been “firmly established” by God so that “it can never be moved”? Aren’t humans the crowning glory of God’s creation? It was only gradually, over the course of a century or more, that the Catholic Church and Western culture at large came to accept heliocentrism as reality. This process was aided not by more convincing data but by the development of a new narrative. The rise of Newtonian physics helped provide this, with its vision of the cosmos and laws of motion as a kind of divinely ordained symphony. Here is the point: the harder element of large-scale scientific discovery is not the actual science part, but simply waiting for a culture’s paradigm or worldview to catch up with that advancement. This “lag” has to happen before a society can integrate new scientific understandings in any meaningful way. Think of evolution in the twentieth century; even today, there are certain groups who do not believe evolution is accurate. I would argue that, for these groups, this is largely because they have not found a way to reconcile evolution with a Christocentric paradigm. My main purpose here is not about science, evolutionary or not. My question is: how does Kuhn’s notion of paradigm shift help us understand the process of conversion? As I mentioned above, whenever I am asked why I converted to Orthodoxy, it is difficult to give an adequate answer. I could point to my disillusionment with Evangelicalism or certain doctrines I had come to take issue with. But that’s merely what brought me to the door of an Orthodox Church, not why I eventually was received into the Church–and why I stay. 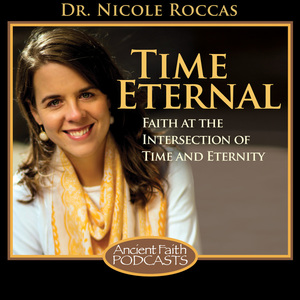 I could also point to specific beliefs I held–about the Eucharist, or the Trinity–that changed over time. But again, none of that fully accounts for my conversion. The best way to explain it is that I experienced a paradigm shift–mysteriously, gradually, wholly. Once upon a time, the idea of venerating an icon (with my lips! In Church!) made my blood curl for its idolatry; at a certain point in time, it no longer did–in fact, it seemed beautiful to do so. Once upon a time, it seemed scandalous to pay homage to the Mother of God; at a certain point, it seemed not only permissible but important. Once upon a time, receiving the Eucharist seemed insignificant, a historical reenactment, a pious but mostly unnecessary afterthought–at a certain point in time, it began to seem like everything, the whole world. What changed was not receiving new information–I already knew about Eastern Christian ideas about icons, veneration being passed on to the Prototype, notions of sacrament, etc. Instead, what changed was my paradigm. A new narrative–about life, creation, matter, reality, Christ’s activity in this world–supplanted the old. This took time. And in my experience, once your paradigm shifts, it is pretty hard to go back. It’s not about being persuaded back to an old set of principles or doctrinal statements; a paradigm is deeper and more expansive than that. It involves how you see and perceive all of life. For the same reason, it also becomes more difficult to explain this paradigm shift–or your conversion–to those who haven’t undergone a similar change. To make things more comprehensible, we may attempt to reduce our conversion to a few bullet points we were intellectually persuaded by, to pin things down to a few anecdotes. But often these “conversion narratives” fall flat, for us and our interlocutor. There was more to it than those points, but how to give voice to that? The old Psalm is true: “taste and see that the Lord is good” (Ps. 34:8). And once you taste and see this, it will change you–maybe in ways you can’t take back or understand on earthly terms. So that is what I tell people who ask me during coffee hour for a pithy synopsis of my conversion. I tell them to stick around, to taste and see, to allow themselves to enter into conversion, in all its complexity. Now I’m starting to understand my difficulty, also. I’m a Catachumen, but will,Lord willing, be recieved into the Church shortly. It really is hard to explain conversion. Thanks for the blog. We can’t explain how good something tastes to another person. They have to try it for themselves. 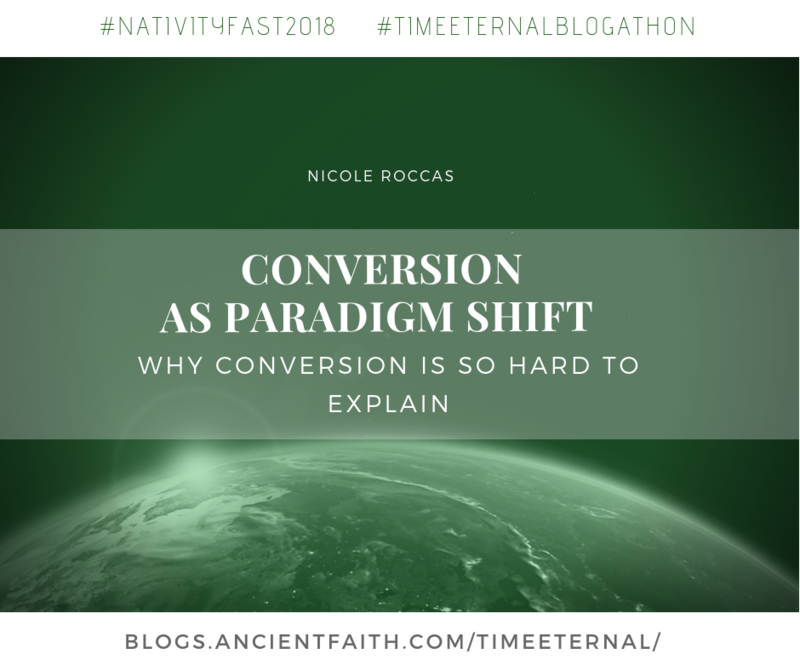 I actually think it’s helpful we can’t fully explain conversion… It takes the pressure off, and reminds us the focus isn’t on ourselves or our own personal story. Our story is being merged with the story of salvation. Thank you for this post, Nicole! It explains what I have been thinking and experiencing since joining the Orthodox church 3 years ago, and why I love it and could never leave. Your Nativity posts have been so helpful, enlightening, and enriching to me. Thank you for all the time, thought and effort you have put into preparing them, and for sharing them. I will be giving my cradle Orthodox daughter-in-law Time and Despondency for Christmas with the plan to read, study and discuss it together. I have read it, underlining many passages, and have listened to Dn. Michael Hyatt’s Sunday school presentations and underlined more, plus adding notes. Putting some of your practices to combat despondency into practice have been life changing for me! I can’t thank you, and God, of course, enough! May the Lord continue to bless you that you may be a blessing. Thank you! May you and yours also have a blessed Christmas! This is true, a shift from the traditional evangelical perspective of conversion as an abrupt sharp turn—-maybe instead, to one of continuing forward on a path which subterranean tremors and quakes have angled significantly upward, aiming steadily toward the Light ahead. It is hard to explain, because there may not be signposts marking the change. Rod Dreher has a related discussion on his blog (yesterday? ), writing about how practice so often precedes understanding, in Eastern religions. Reason contributes, but has limits. My grandparents’ church services, years ago, included a Sunday morning prayer in which everyone knelt. The body catechized the mind. This practice has been left behind, but it was engrained in my memory weekly, for the first seven years of my life. There is a a humility, a letting go, a freedom in bowing. I appreciate the majority of the article but a bit more careful attention could be paid to the characterization of why the Catholic Church was less than exuberant about Galileo. In Galileo’s day there was more than Jesuit in the Vatican observatory who believed it likely that Earth had a heliocentric orbit. One problem is that astronomers of the time knew a heliocentric orbit should be evidenced by observable parallax shifts, but they lacked instruments sensitive enough to detect them in that day. This is one reason Tycho Brahe would not wholly endorse Galileo. What initially got Galileo in trouble was arguing heliocentric view as “Truth” when it had not yet been proven. What got him in much deeper hot water was when he went further and began making theological arguments based on his theories. This may seem nit-picking but I don’t think we ought to perpetuate the too common contemporary view that Christianity whether Eastern or Western was or is anti-science. Galileo probably suffered unjustly, but strictly speaking we can’t say it was because of his science, but rather his personal opinions of how he thought his scientific theories related to theology. I agree, this is a much more nuanced issue than the way I depicted… I purposely glossed over it a bit because I was already well over the usual word count. At the same time, I don’t think I insinuated that the Church (east or west) was against science; my point in that paragraph was that they lacked a narrative to make sense of and grasp the concept of heliocentrism (and I specified the Inquisition for a reason). The objections I mentioned were voiced by prominent actors in the Inquisition and elsewhere in the Church who tried to evaluate Galileo. But you are very right that there were many other factors… Further indication of the ones you mention was that nascent concepts of heliocentrism weren’t all that controversial in the wake of Copernicus–or at least not as controversial as they became with regard to Galileo, who as you say at times extrapolated beyond the scope of astronomy or even what had been proven. Thanks for fleshing some of this out in your comments and reminding us of this! This is so helpful! When I look back, I often think of a specific “point of no return” that I reached when I suddenly realized that, despite the struggles and questions, I could not return to Protestantism. I couldn’t really explain why, except that I knew that a fullness and truth existed in Orthodoxy that was missing elsewhere. Flash forward several years… Yesterday my husband told me about a Bible study at his work on Mondays, and he’s reluctant to visit. What?! Earlier in our Orthodox life, he might have attended. But now, his hesitation is more than a question of authority and interpretation, denominational allegiance, or arid philosophy–it’s about how we view and experience God, life, and the world. A paradigm shift! Thanks for articulating this. Thanks for writing, Lynette! I get your husband’s reluctance. For me, too, part of the paradigm shift means I have gradually lost the ability to “speak” Evangelical. Attending services and Bible studies with friends still in that world became a lot more difficult two or three years after I’d converted. Until then I was able to fake it and not stick out like a sore thumb, now those experiences leave me feeling discombobulated. Did I really believe all that stuff? In any case, have a blessed Nativity! Reading your article takes me back to our search for a home. I think many people are searching for truth and when they find the orthodox church they find the truth they are seeking. After that it is like peeling and onion. Peeling the onion, indeed. Love that analogy. Thanks for writing, Allen! Have a blessed Nativity. Chesterton speaks to the difficulty of explaining conversion…and I’m always happy for opportunities to quote him! In some respects I think I’ve experienced less of a paradigm shift in some aspects, but in some ways greater. I’ve written about this elsewhere, but as basically an adult convert to Christianity, Evangelicalism was always ill-fitting for me in the first place. As I tried to explain to my wife recently, looking back now I’m not really sure I could even say that I was a Christian before jumping into Orthodoxy. I certainly could not be vocal about my faith, in no small part because I didn’t know even what I believed beyond some basics, given that each church we attended seemed to have a different theology (and even at one church, I think the pastor himself had a different theology from week to week). The praxis of Orthodoxy – kissing icons, incense, and so forth – has not been much of a jolt (I’ve long loved icons, and had acquired several over the course of some 25 years). The only challenge there has been learning what to do and when (I embarrassed myself a bit on my first monastery visit, for instance). My wife and kids have been a lot more uncomfortable with my doing that than I have (none of them have wanted to take the plunge). What has been remarkable for me, and something I found happening almost right away, was that my desire to pray and to be in church exist at all. Getting me to church in my Evangelical days was a challenge. I went mainly out of a sense of duty, never with enthusiasm or joy, and I often left annoyed or even angry at the music (“This isn’t worship!” I would fume), or the sermon (is there really that much exegesis to be squeezed from half of a verse?). Weeks where I miss a service due to illness, travel or other obligations always are jarring to me. It had gotten to the point where I was about ready to throw in the towel, and now, instead, church is the highlight of my week. *That* has been a huge shift, along with being able to actually talk about what I believe, and why. I could go on (and on and on…). So I’m now telling everyone who will listen, “taste and see”. I could explain it all till I’m blue in the face (or they’re bored to tears), and I’ve talked with some people for hours, but I always tell them that what they really need to do is come to church. Come to THE church.